The dust- and water-resistant keyboard and touchpad have special keys for more functionality. For each deployment, keyboards are localized to the primary language of that country, so your keyboard may not match the one in this figure exactly. Keys outlined in yellow are reserved for future features. The escape key is labeled with an × symbol on a black circle. The escape key is most commonly used in combination with the control key to quit activities (ctrl + esc). 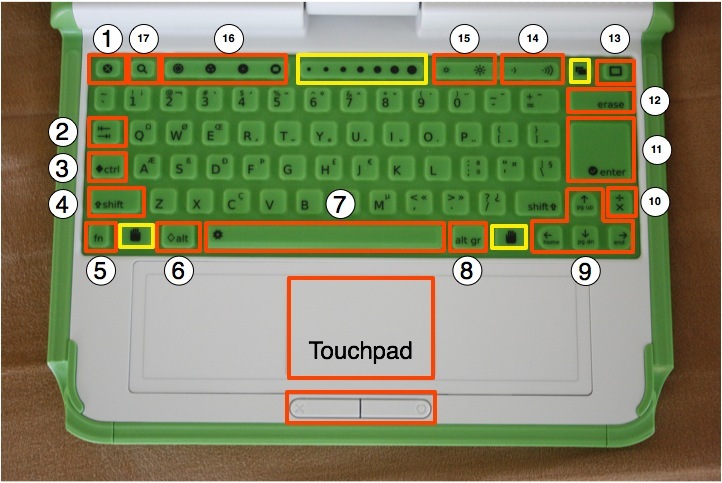 The tab key is labeled with arrows pointing right and left and creates an indentation in a paragraph. Also, use it in combination with the control, shift and alt keys to display open Activities. For example, alt + tab displays running Activities one after the other. The control key is used in combination with other keys to issue commands. For example, ctrl + c copies to the clipboard; ctrl + v pastes from the clipboard. The shift key is used in combination with other keys as a modifier, most commonly to shift between lowercase and uppercase in Latin-based alphabets. The function key is used in combination with other keys as a modifier. For example, fn + erase is delete; fn + up arrow is page up. The alt key is used in combination with other keys to issue commands. For example, alt + enter toggles full-screen mode; alt + spacebar toggles the tray visibility. This example works in the Browse Activity but not in the Record Activity. The spacebar key types a space. In the future, when used in conjunction with the function key (fn), it will display the source code for the currently running Activity. The alt graphics key is used in combination with other keys as a modifier, most commonly to select an alternative letter or generate an accented character. For example, on the US keyboard, alt gr + j creates a euro sign €; a + alt gr + 4 creates á. The arrow keys are used for navigation; combined with the function key (fn), they are used for page up, page down, home, and end. The language key is found on keyboard layouts that combine Latin and non-Latin scripts, going between scripts so that you can switch between typing in English and Hindi by pressing it. On Latin-only keyboards, the language key has been replaced by a × and ÷ key. The enter key—in addition to its standard use—is used in combination with modifier keys. For example, alt + enter toggles full-screen mode. The erase key deletes the character behind the cursor (backspace). fn + erase deletes the key in front of (or on) the cursor. The Frame key toggles the presence of the Frame on the screen. The Frame is the black border around the screen that holds the Activity taskbar, clipboard, wireless connections, battery level, and so on. The volume keys lower and raise the audio level. The brightness keys lower and raise the brightness of the screen backlight. To turn the backlight off completely may take 7 to 8 button presses. The four view keys, from left to right, take you to the Neighborhood view, the Group view, the Home view, and the Activity view. The search key takes you directly to the Journal and places the text cursor in the search box.